The best brochure done for the little Flandre. Full of large interior photos and the lovely MMarie Centerfold. Excellent, excellent condition. 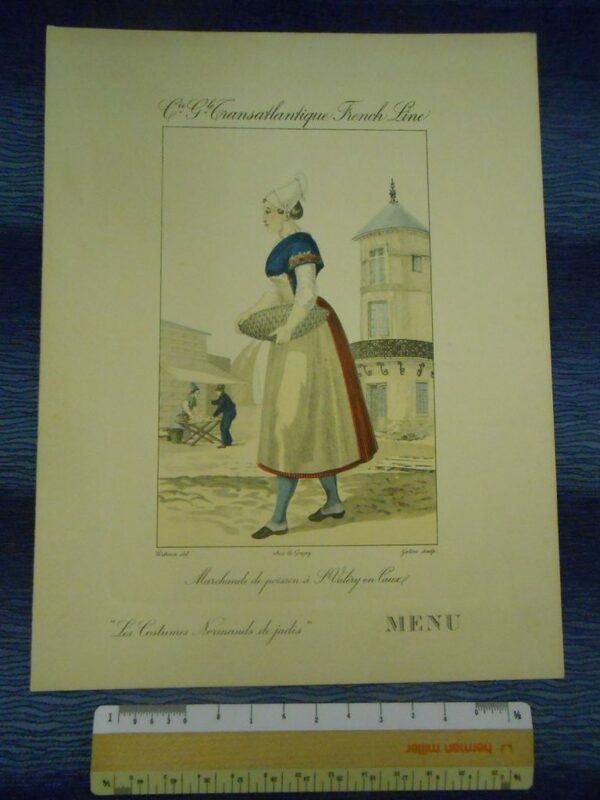 Lovely dinner menu dated September 18 1936 for the over the top deco Normandie. The menu is written in both French and English and included chef’s suggestions! the cover art is recessed in an embossed frame .. just gorgeous! The maiden is wrapped in a red shaw and is watching 2 men beach a small boa. Small wine stain on the cover. A modern Placement for the De Grasse of 1924. 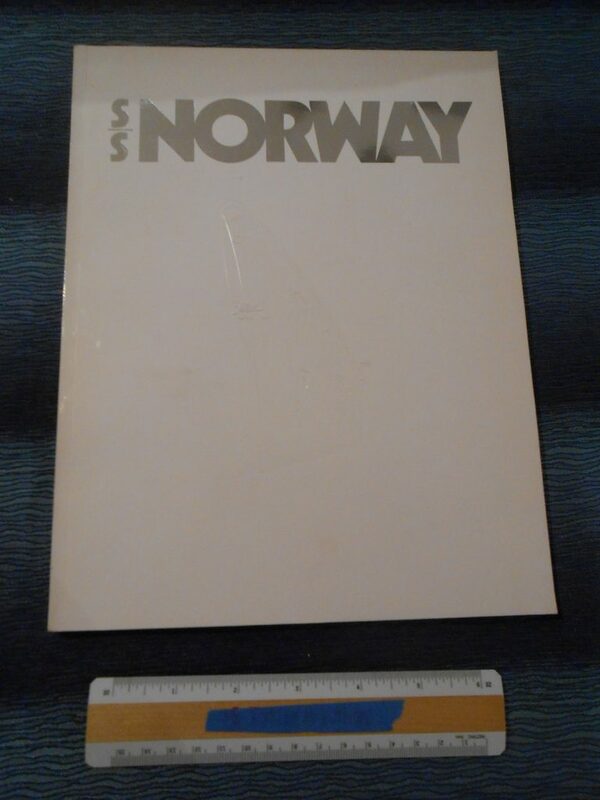 This has a very heavy cork backing I suppose it could be used as a lap writing board. The De Grasse barely survived WW2 and was rebuilt to initiate the French Line service when the hostilities ended. Excellent shape. 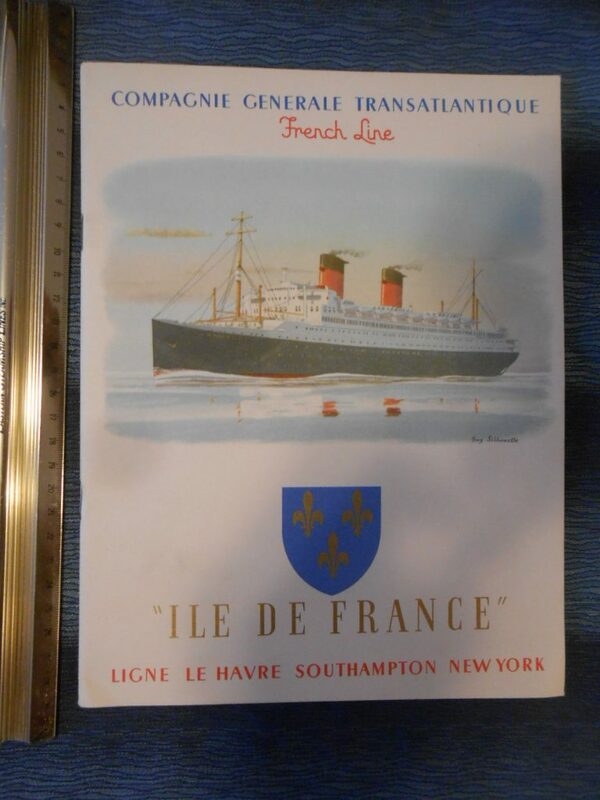 Simply the nicest brochure ever done for the little French ship. Know as the “Flounder” for her limping into NY Harbor on her maiden voyage. This brochure is filled with great interior photos and an outstanding centerfold portrait. 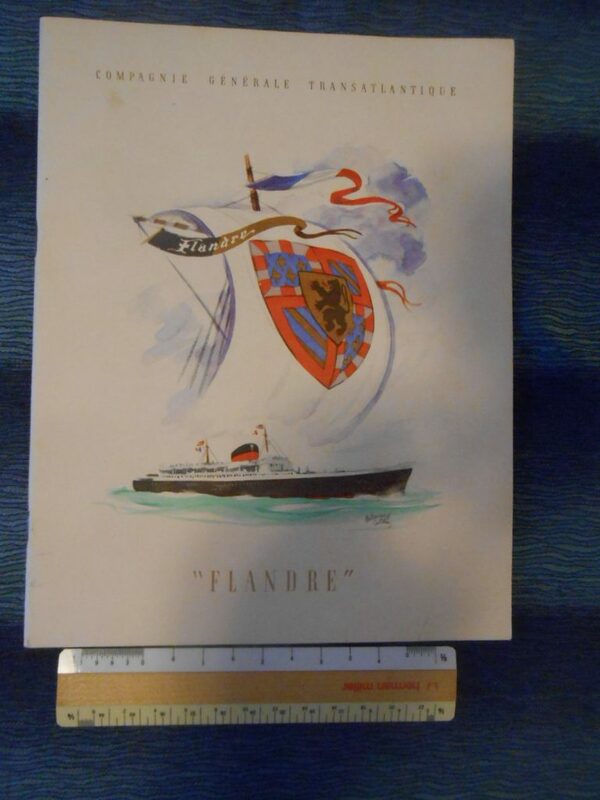 Lovely heavy stock cover with a vibrant color portrait of the ship and her “shield” symbol. 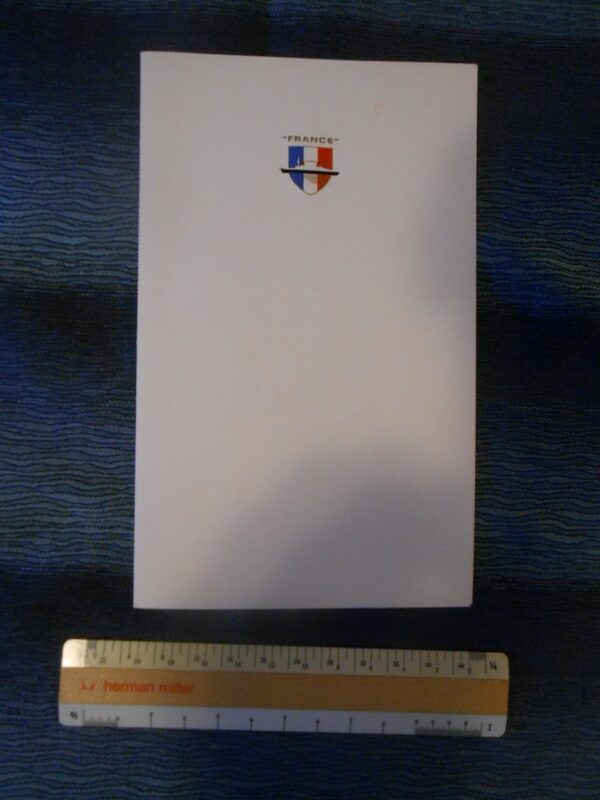 Great little SS France menu from May 1973 … lovely embossed cover and excellent shape. 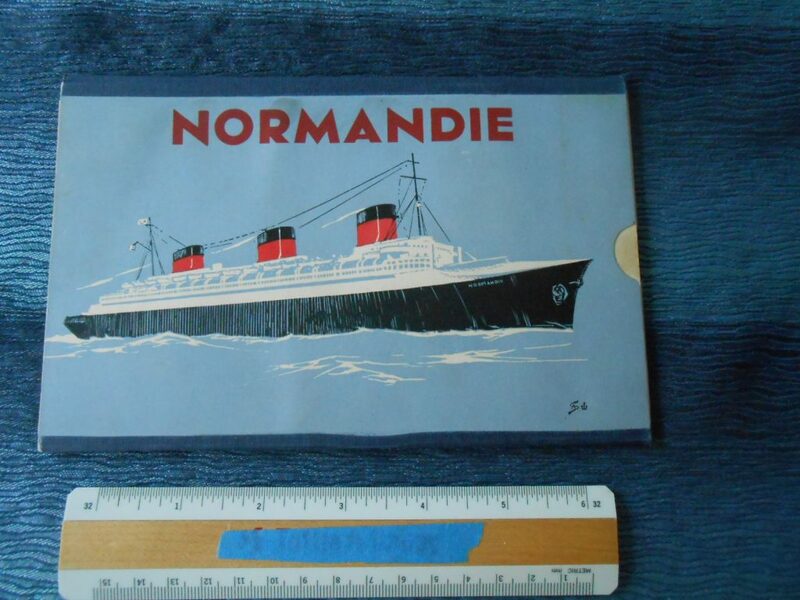 French Line: Normandie Slide Rule First Class Deck Plan. 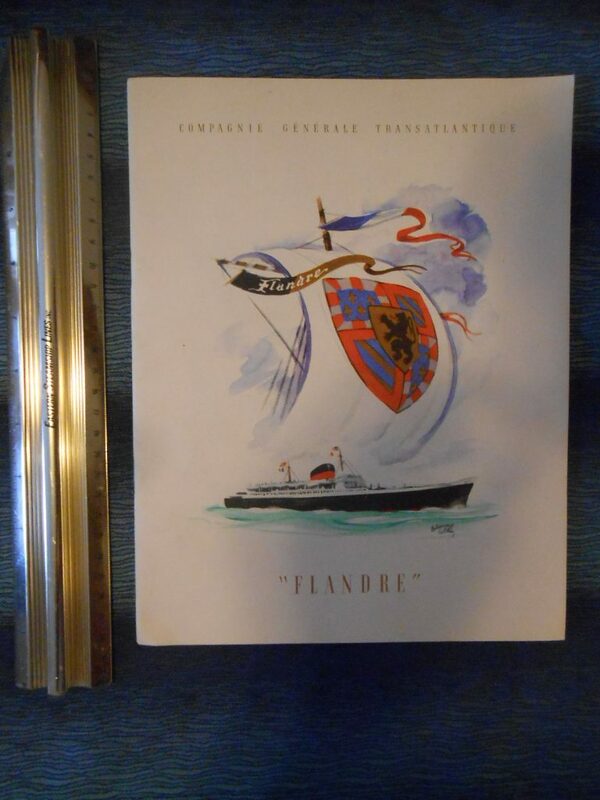 Probably the most exquisite top notch deluxe deck plan ever done for a ship .. and of course it is for the unforgettable Normandie. 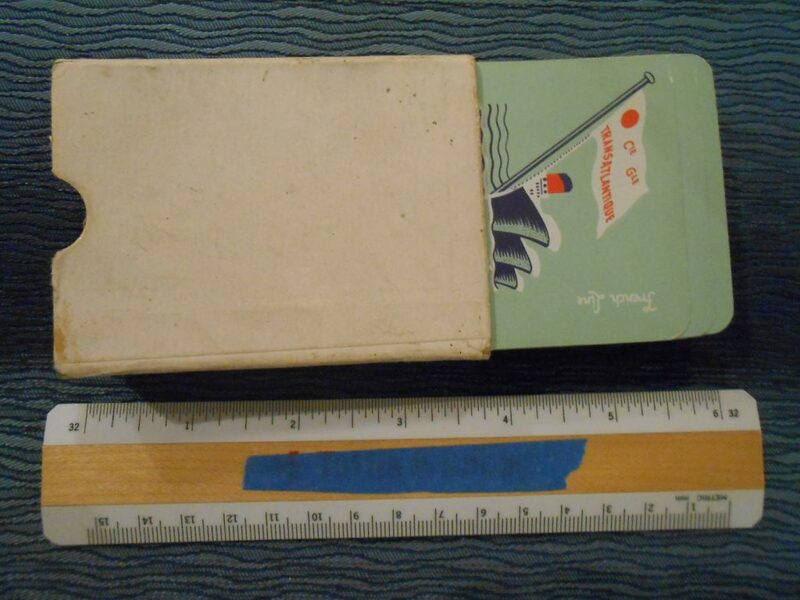 The trifold plan is in excellent pristine condition … it looks like this was kept in a drawer for the past 75+ years. Best brochure done for the lovely post war Liberte. 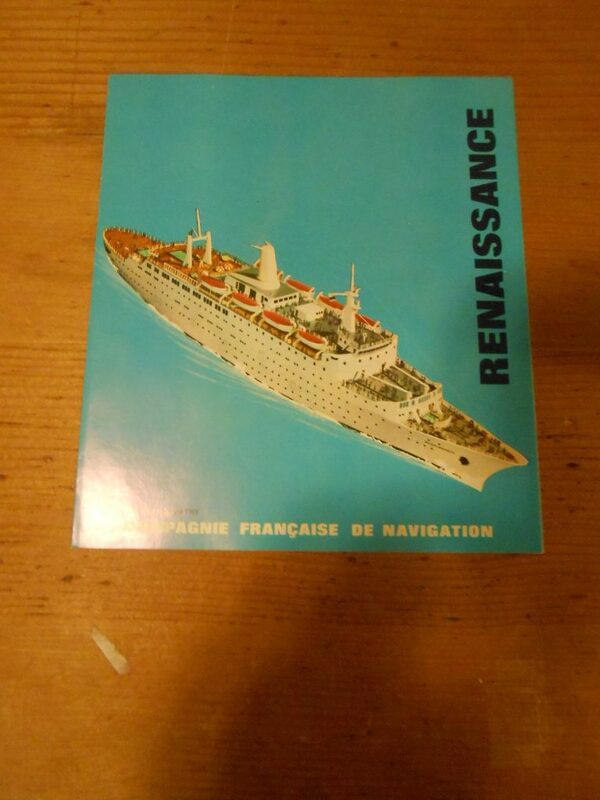 This the early version of this brochure that was filled with renderings and was redesigned after the Liberte came into service and packed with Photos … this is an excellent brochure! The centerfold is an incredible Starboard photo of the Liberte. 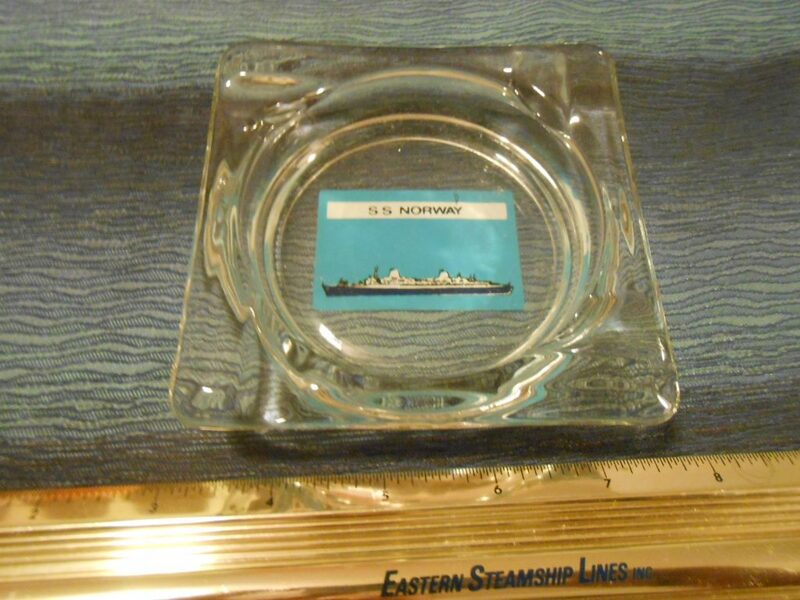 A must have item for this lovely vessel. Gosh-darned-rootin-tootin best brochure done for the lovely post war lle. Her interiors were mostly redesigned and upgraded … but they NEVER lost their early deco influences. Packed with Photos …this is an excellent brochure! Outstanding Marin Marie Centerfold of this beauty that would make Hugh Hefner blush if he liked ships like he likes the gals.! 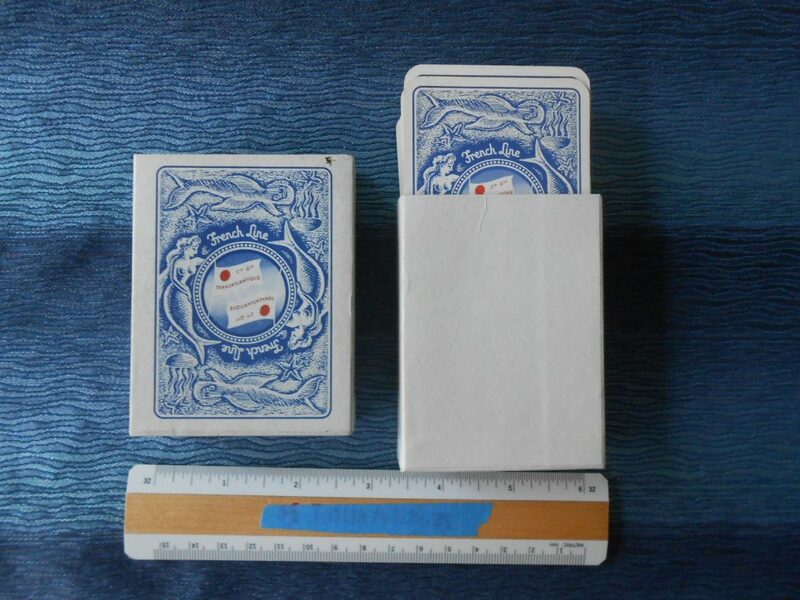 Lovely set of playing cards in excellent condition. Gold edges and great house flag and undersea graphics including frolicking mermaids! 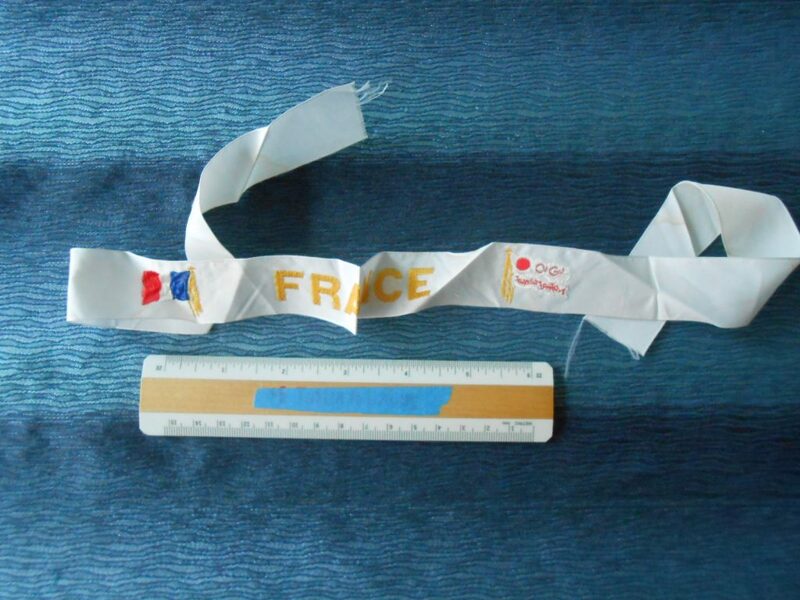 Lovely white souvenir hat ribbon from the mighty France! 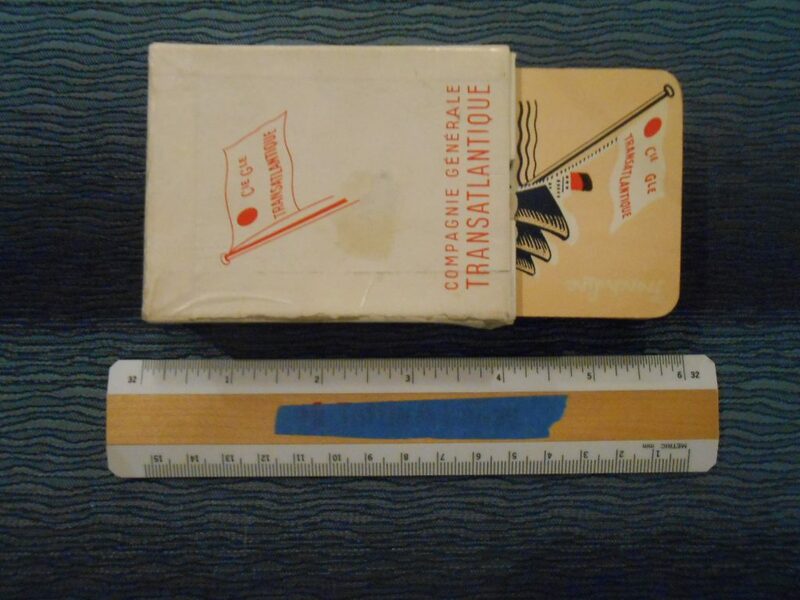 Lovely set of mid 50’s French Line cards with yellow background. Excellent shape for being opened and used … complete set! 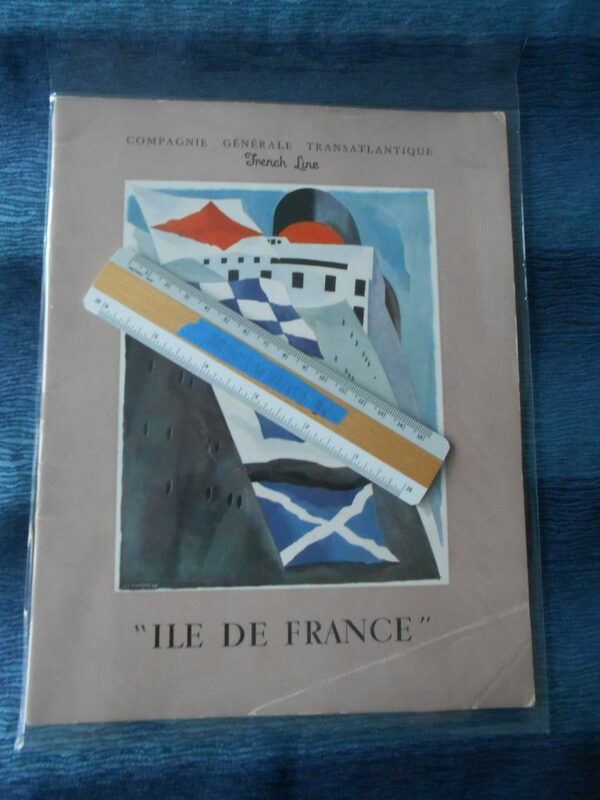 Lovely set of mid 50’s French Line cards with green background. Excellent shape for being opened and used … complete set! 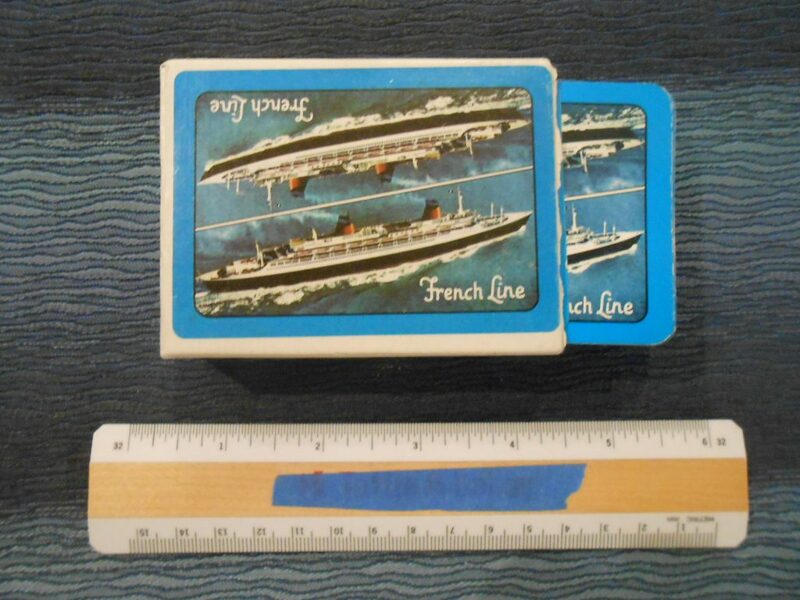 Love this double hulled portrait deck of cards for the Lovely large Flagship SS France. Excellent condition for being open and used. 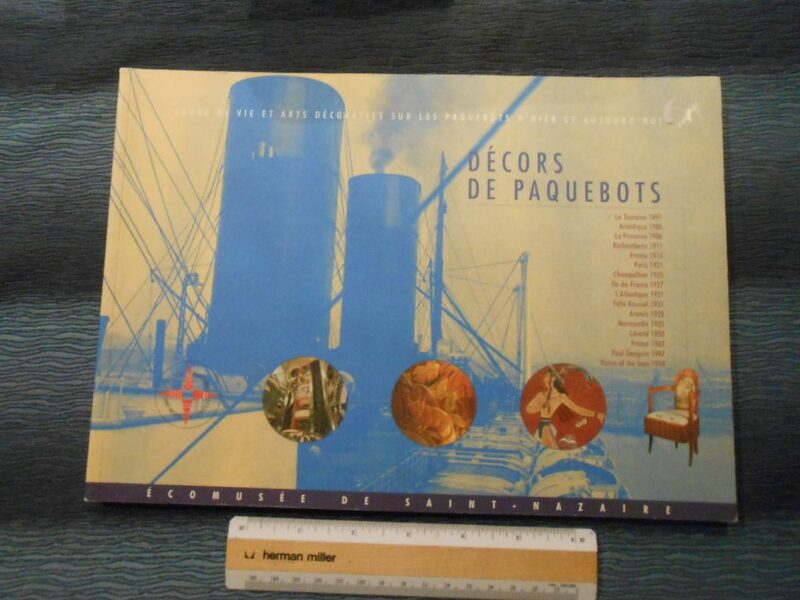 Excellent book of French ship interiors covering a little over a century from the 1891 La Tourraine to the French built 1998 Vision of the Seas. Outstandingly done .. the photographs of Interiors and furniture, artwork and some fittings are just delightful. 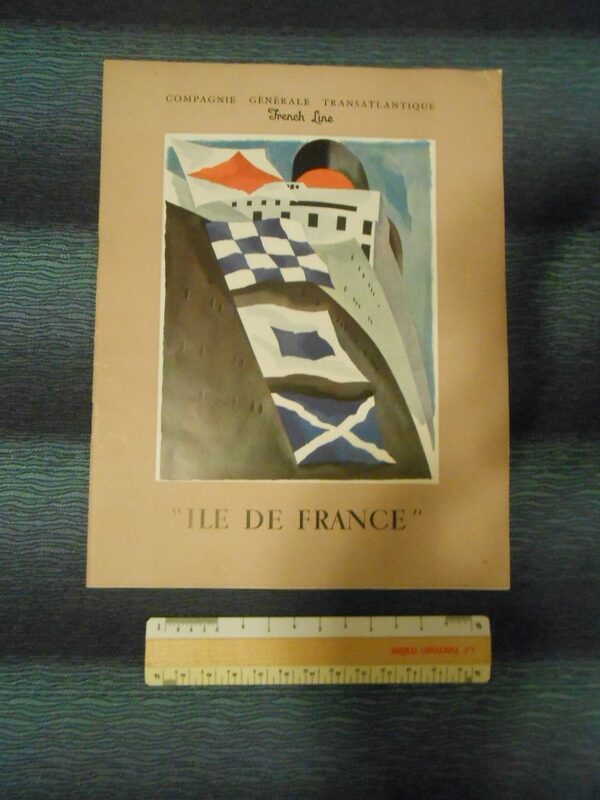 Don’t miss the section on the Ile de France or Normandie. Of course written in French .. this is a hard to find book. A tiny little scuff to the cover is the only blemish from use. 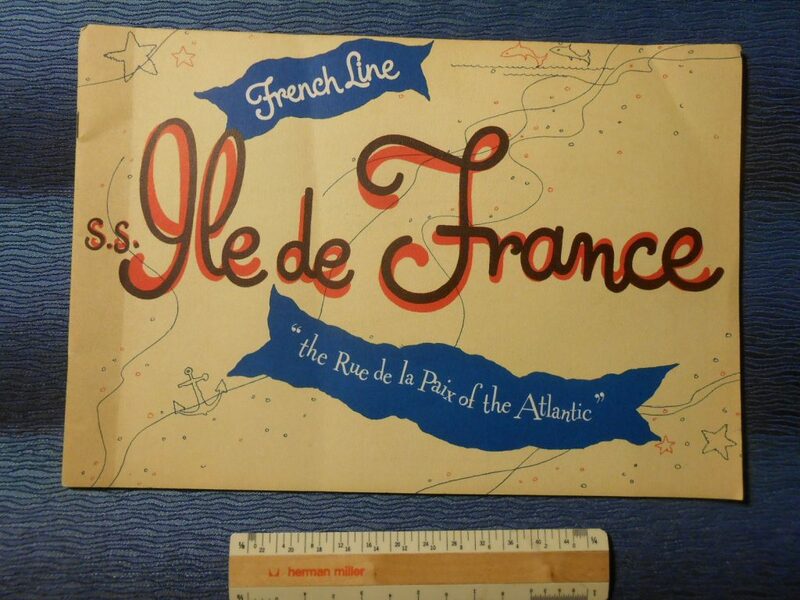 Rue De La Paix of the Atlantic is just one of my favorite Brochures for the Ile de France. This is filled with great photos and wonderful renderings showing the joyful and gay life onboard the ship. In great shape with a few minor cover bends. Don’t miss this one! Great little interiors fold out for the France …. the last true French Flagship. Excellent shape! 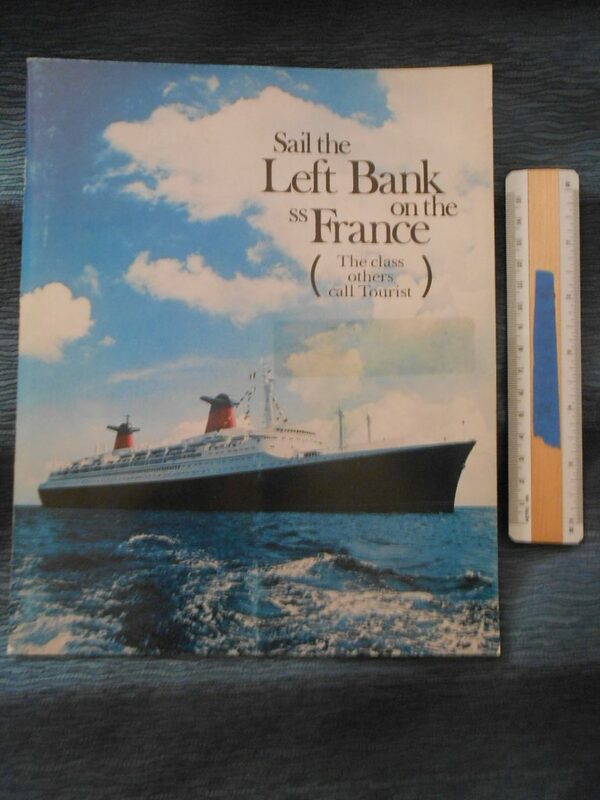 French Line: SS France Sail the Left Bank Tourist Brochure. This is my favorite brochure done for the France. It is full of great and unusual photos of public room and cabins as well as activities onboard. 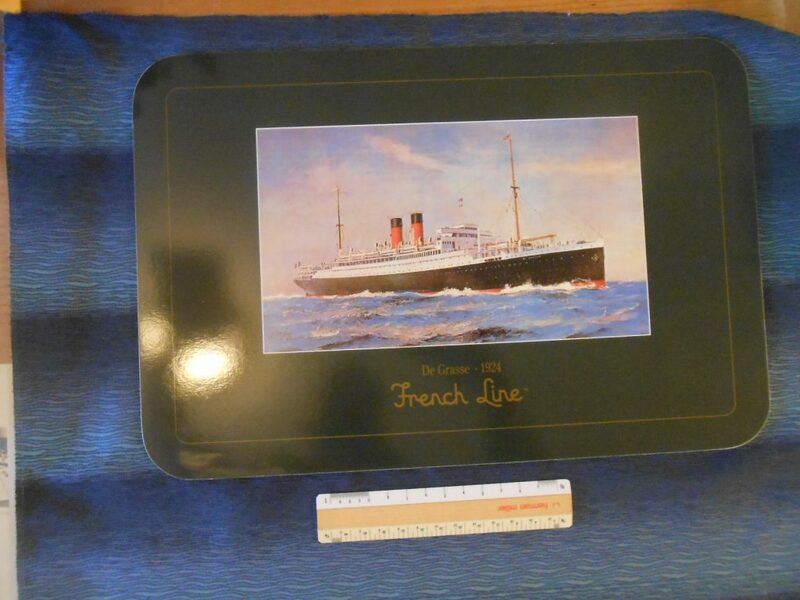 No date, but certainly after November 1969 when the SS United States was retired .. and the text advertises the France as the Longest Largest and FASTEST passenger ship. Excellent condition the is a label mark on the front cover. 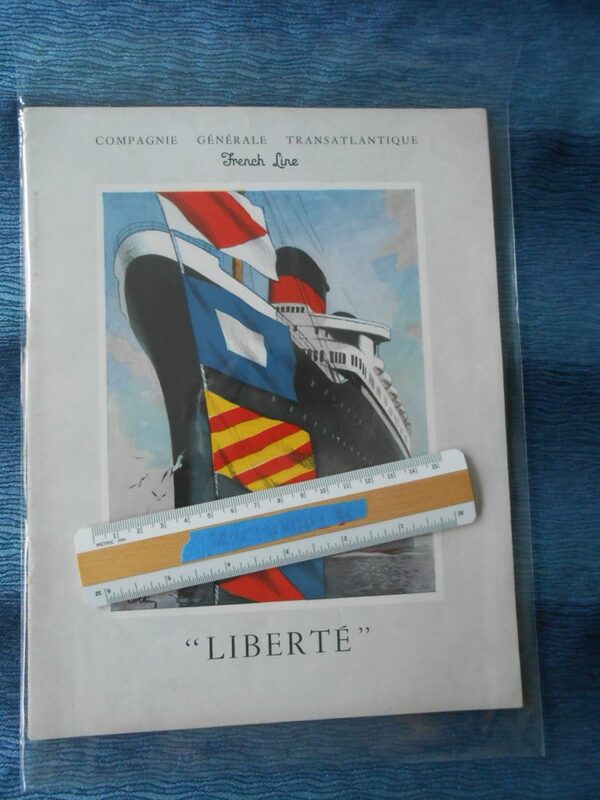 French Line: Ile De France Ultimate Post war brochure. and deck plans. Excellent condition. 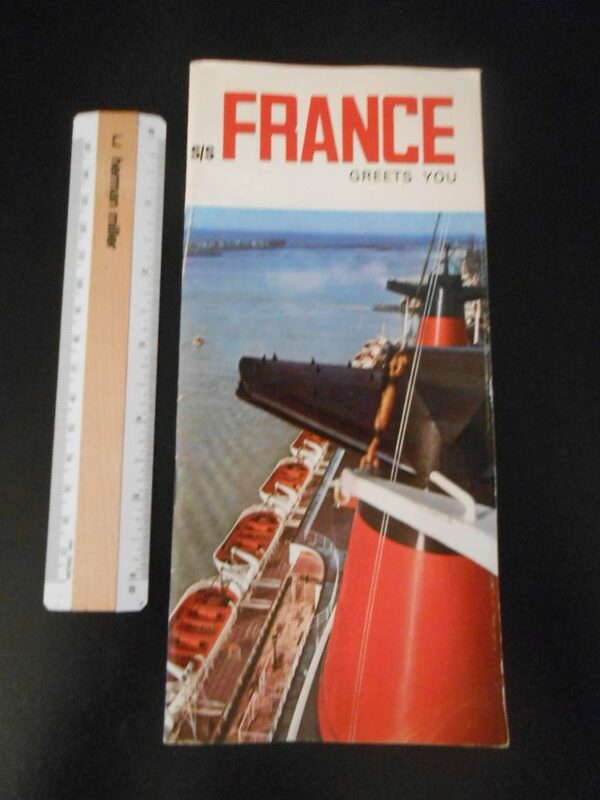 French Line: SS France Greets You Brochure Booklet. 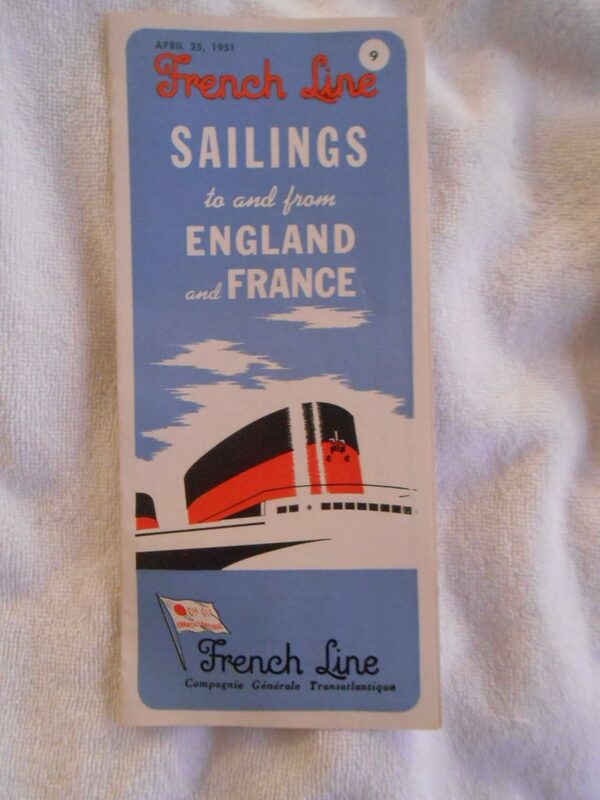 Lovely brochure booklet for the France. 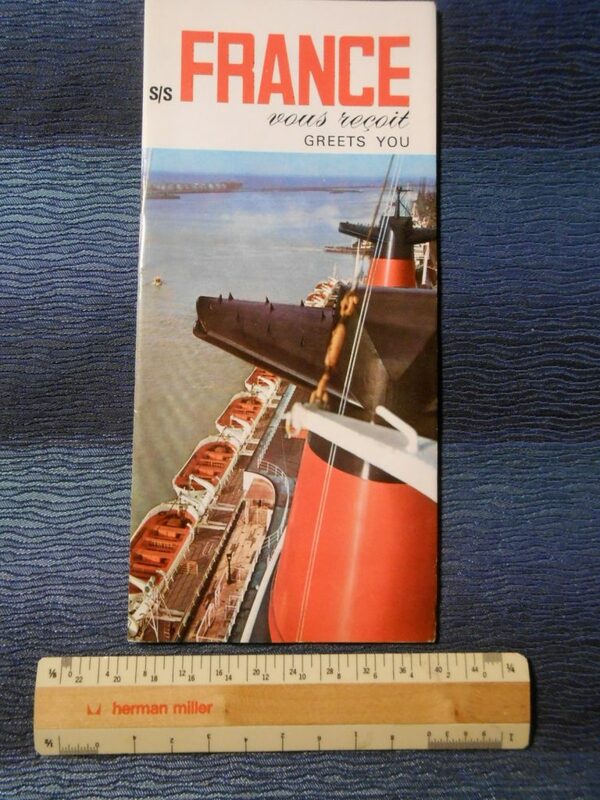 Nice booklet packed with photos and a lovely centerspread of the ship. 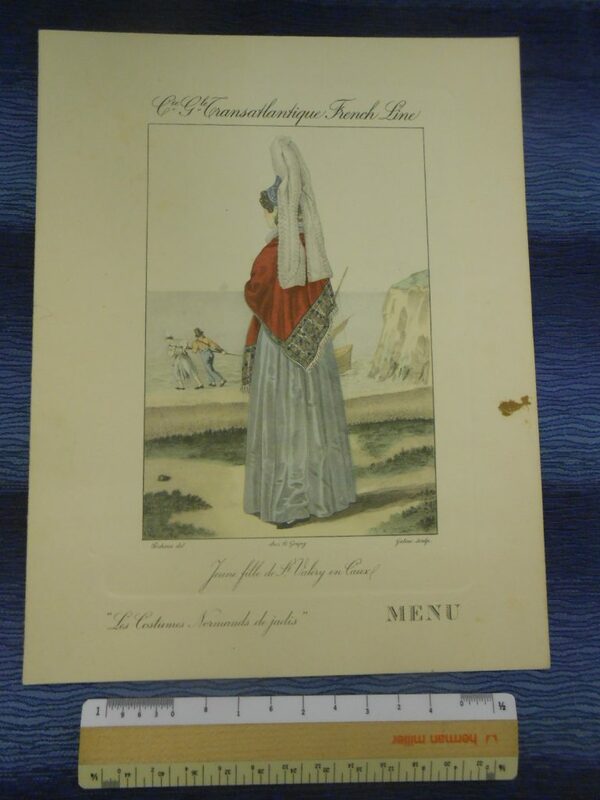 There is also a nice colored foldout profile of the ship showing tourist and first class spaces. Lovely cover showing those mighty winged funnels.